I have blogged often about the ADHD adult's tendency to suffer from what I affectionately call Multi-Irons Syndrome. You know… When you are busy working on cleaning the garage, but you also remember you need to research plumping to fix the guest bathroom, and you wanted to sort all your digital photos by date and color, while also making time to fill out your taxes? That sort of thing. There isn't time in the day to get it all done. The thing with ADHD adults is that they don't seem to know that, so they get busy—and very stressed—trying to finish what they started. Meanwhile, they suddenly remember that the car needs to be vacuumed, and who can ignore that glovebox. While you're at it, right? There are three ways that I'm going to recommend for you to solve this problem. Don't care. I mean, have you seen what's available on Netflix lately? Wow, that House of Cards. I wish Kevin Spacey was my senator! But in all seriousness, there's only so much time in the day. Pick one project to work on and tuck the others away until you've finished the first one. Then make yourself stop worrying. All the worry in the world won't help you finish 17 projects simultaneously! If you absolutely cannot focus on only one project at a time, let's try taming your ADHD mutant out-of-sight-out-of-mind power. 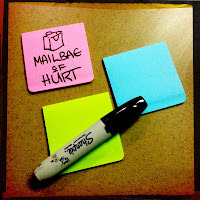 If you need to remember to prune the mail pile, instead of sitting the pile in front of the door so that you can't possibly ignore it (thus causing your significant other to curse your name every day they jump over it on their way out), tuck the pile neatly away and use colored index cards or Post-it notes instead. You need things visual to help you remember, right? Choose a wall in a place you will constantly see and place three different colored index cards on it, one over the other with the most important at the top. I use my front door for this and find the brand new super sticky Post-it notes perfect for this. List your three most important projects, one per card, on the wall. Make the letters clean and large. Add a visual cue if you wish. Anything to help you know the task at a glance. Your significant other will likely agree to this if you can promise them this means you'll stop putting the trash bag on the doorstep as a visual reminder from now on. When you finish a task, chuck it and move the others up. You can create a stack of tasks you keep off to the side that you pull from and place on the door as you complete the others, but never more than three at a time. You may enjoy switching between projects to alleviate boredom, but if you have too many active projects you won't finish very many of them. If you have a smart phone, you probably know about the cornucopia of task managers out there, but todo lists are like junk piles. They tend to accumulate projects over time until they become hard to manage. I have found an app that might be an end to that problem. 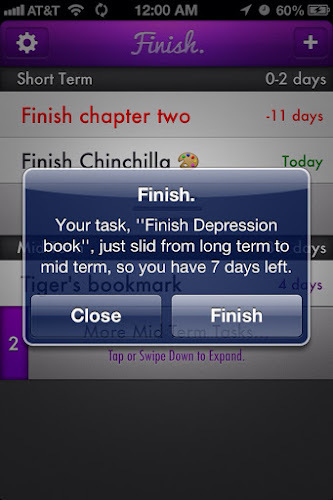 It's called Finish, and it's available for the iPhone and iPod Touch . The concept behind Finish is simple. Create some tasks, set the due dates, then get busy on them. Finish will remind you. The app organizes your tasks into three categories: Short Term, Mid Term & Long Term. Each night it will post a notification about which tasks are still due and which tasks changed from, for example, Long Term to Mid Term. Swipe to the left on a task and reveal a submenu. Here's where you can check the task off, give certain tasks visual priority by starring them, change their due date, or share the task to Twitter & Facebook if you so choose. And all of this put together by a programming team still in High School. Very impressive. 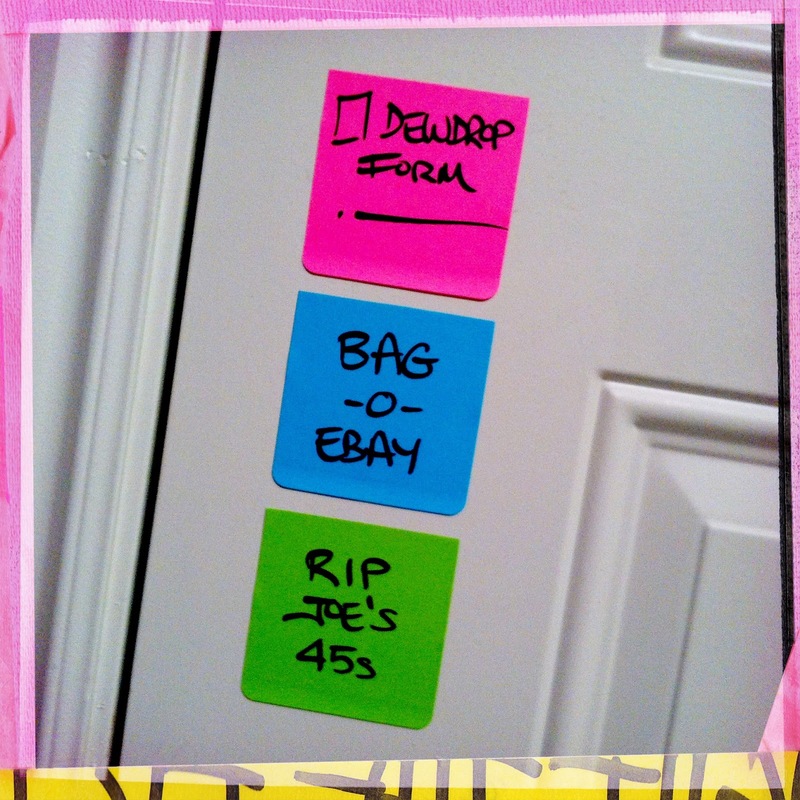 Personally, I found the reminders too subtle for my ADDled mind. I went into the Notifications Center and changed the default banner notice to be an alert one. More in my face. Also, you can't change what time the app lets you know when a project slips from one term to the other. The app makes the announcement at midnight during the calendar change. I'm usually up then, but if that's when you're normally asleep you may appreciate the app's subtleness. When you wake in the morning, Finish will have added entries to the Notification Center. You do check your Notification Center don't you? The downside to an app like this is that it is only affective if you don't put in too many projects. Try to keep it to 3–5. Any more and you're dealing with Multi-Irons Syndrome again. If you absolutely have to put them all in there, make sure to stick the least important projects in Long Term. You can always change their dates later. Another downside to the app is that entropy rules and if you don't work on your projects, everything will eventually slip into Short Term with red, negative numbers letting you know just how unproductive you are. This is better, though, than the index card system. If you ignore those, they'll fall off the wall and get stepped on & forgotten. Overall, Finish is a great little app perfectly tailored to manage your projects. It is possible to stay on top of your projects if you have ADHD, especially if you have a tendency to throw more and more irons into the fire. You're going to need to retrain yourself, but any one of the three systems I've mentioned is a great place to start. Soon your doorway will be free of reminder obstacles, your big projects will be behind you, and you'll be checking off new projects one after the other. Right after you clean out that glovebox.